I’m not sure what it is exactly that gets my mind going a million miles an hour while I’m walking Bella, but if you catch me talking into my phone and recording things next time it’s because there is so much that comes to mind and I don’t want to forget it! Two things in particular this morning really hit me. I see all of the flags starting to go up around town, in peoples yards, on FB profile pics…It seems like so long ago but I wonder how many people on this day in 2001 appreciated everything that came their way. None of us are promised tomorrow…did those victims know that?Did they live in a way that showed that? What about the families left behind…did they make the most of the last day they had with their loved ones? Did they set the craziness of life aside for a few quality moments with their child? Were they intentional to tell their husband they loved them before they fell asleep that night? James 4:14 says “Why, you do not even know what will happen tomorrow. What is your life? You are a mist that appears for a little while and then vanishes.” Are we taking the time to appreciate what life means today? To make the changes we want to see tomorrow? To be the friend to the one with none, the guide for the lost, the hope for the hopeless? As I talk with a friend from Iraq I think of how just on the other side of this world things can be so different. While I sent my daughters off to school with prayers for their safety…she was not able to go to school because her school has now turned into a home for all of those who have lost theirs. What about her dreams for her future, her tomorrow? Praise God, I know that she knows who holds her tomorrow and I am envious of the faith she has and the ability to stand in a trial like she is facing. Don’t waste this day… Oh- and the other thing I could not help but notice this morning- it was literally surrounding me…spider webs! I know- gross…I so don’t appreciate walking into them when I can’t see them and certainly don’t appreciate meeting the little fellow who created them. 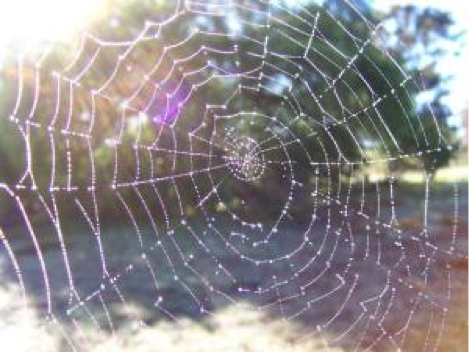 BUT as I walked this morning and looked around I was surrounded by beautiful webs- circles and octagons…shimmering little strands of silk suspended between trees. And the only reason I could see them was because the sun was shining directly on the trees illuminating them. How true is that for us each day? We go through life with these little annoyances, sticky situations, etc…but when we shine Gods light on them…let His truth illuminate the way, we can see the beauty in each situation. Today I am looking for God in everything…even the silly little things that seem so unworthy- God uses everything for His good. Would you like to join me? I’ll keep you in prayer and would certainly appreciate yours to help me stay focused! Bloom where you’re planted…even if it is New Jersey? ?